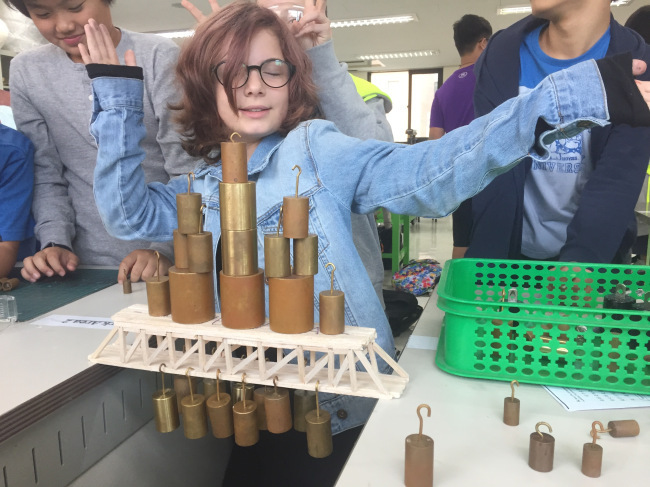 Last week, seventh and eighth grade engineering students from Korea International School finally tested how much weight their bridges could withstand after weeks-long efforts to construct them through real-world engineering techniques. In a departure from the traditional method of learning through textbooks, students from KIS were given a chance to research, plan and design the actual bridges in their own labs as a part of KIS’ school-wide Applied Learning initiative. Through such an assignment, the school aims to encourage students to learn and apply the idea of Stanford Design Thinking Model, a vital part of the KIS curriculum in engineering courses, the school said. The Stanford Design Thinking Model requires students to first define problems, draw possible solutions and implement them. It consists of five steps: emphasize, define, ideate, prototype and test. To take the bridge-building project for KIS students as an example, the students questioned why and how human beings have built bridges over the centuries and studied bridge designs as well as various applications of technology before constructing the actual bridges. The students for themselves laid out plans and drawings of potential bridge designs and recreated the bridges digitally through an engineering software program Computer Aided Design. Based on digital simulations, the students figured out how much stress the bridges could endure and identified areas that need to be reinforced. The students then built their actual bridges fused with their own personal flair and artistic embellishments after several attempts to make sure that angles and lengths are precise and fit perfectly. They also used a force sensor to analyze the weight applied to their bridges. Over the course of the project, the students analyzed how and why the bridges succeeded or failed in withstanding the weight, which KIS said helps them improve their future construction projects. In the coming weeks, students from KIS will design, plan, build and test interactive toys for their junior elementary school students. The children will test the prototype toys and give feedback to the students, the school said. Such projects for applied learning and hands-on activities take place not only for middle school students, but also for elementary and high school students from KIS, to help them enjoy the benefits of a “deep and lasting” education and develop abilities they need in whatever field they choose, KIS said. The Pangyo Elementary KoLABs allow students to take science, math and engineering concepts and use them to design and test real products. In the Seoul Campus Design Center, kindergarten students created solar powered cars that navigated successfully through a Lego city. The high school offers courses for students to build and program robotic devices to solve complex tasks. “We want to graduate highly educated students who shine in their universities and careers, but even more, we want to produce people with the creativity, breadth of knowledge, and global citizenship to positively change the world,” said KIS School Director Stephen Cathers. KIS, which first opened its doors to students in 2000, aims to help students gain problem-solving, decision-making and creative-thinking skills as well as academic success through curriculums with a focus on applied learning. The school has seen impressive admissions results with students admitted to such top schools such as the University of California, Berkeley, Massachusetts Institute of Technology and Stanford University.